Natural Health Practice - Brain and Memory Support encourages concentration, sharpness and focus. A special combination of carefully chosen nutrients to support healthy brain function and memory. When you are aiming to keep your brain and memory functioning well, you want a good combination of nutrients to support your body`s ability to do that. Brain and Memory Support contains a useful combination for promoting healthy brain function along with the three most important B vitamins (B6, B12 and folic acid) at their optimum amounts. It also contains vitamin B5, phosphatidyl serine, acetyl carnitine, l-taurine, l-arginine, alpha lipoic acid, co-enzyme Q10, phosphatidyl choline, kelp, vitamin E, vitamin A, selenium and zinc. Zinc and iodine (from kelp) contribute to normal cognitive function, vitamin B5 is for normal mental performance and phosphatidyl serine, phosphatidyl choline and acetyl-l-carnitine are for cognitive function. This product is Kosher and approved by the Vegetarian Society. It is made without the use of artificial flavours, colours or preservatives. Phosphatidyl choline, L-Arginine, L-Taurine, Tyrosine, Acetyl carnitine, Alpha lipoic acid, Phosphatidyl serine, Vitamin B5 (as Calcium Pantothenate), L–Leucine, CoQ10, Vitamin B6 (as Pyridoxal-5-Phosphate), Vitamin E (D Alpha Tocopherol), Zinc (as Citrate), Folic acid (as Methylfolate), Vitamin B12 (as HydroxyCobalamin), Vitamin A (as Acetate), Selenium (as Methionine), Iodine (from Arctic Wrack Seaweed 40mg - Seagreens®: Ascophyllum nodosum), Capsule Shell: vegetable cellulose. For best results take 1-2 capsules daily with food (or as professionally directed). Store in a cool, dry place away from heat and light. Long term intake of 20mg Vitamin B6 may lead to mild tingling and numbness. Below are reviews of Natural Health Practice Brain and Memory - 60 Vegicaps by bodykind customers. If you have tried this product we'd love to hear what you think so please leave a review. Excellent product, has helped my memory loss enormously, would highly recommend. Natural Health Practice Brain and Memory Support encourages concentration, sharpness and focus. 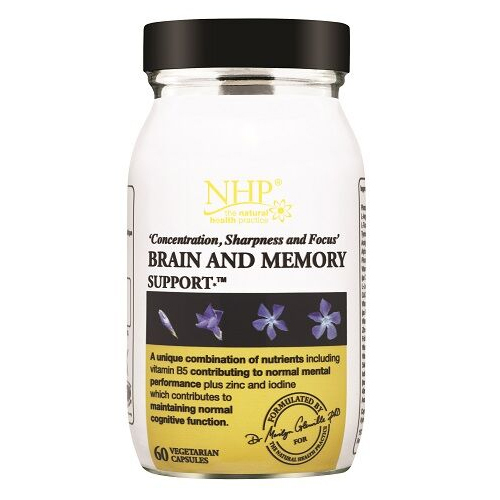 A special combination of carefully chosen nutrients to support healthy brain function and memory.